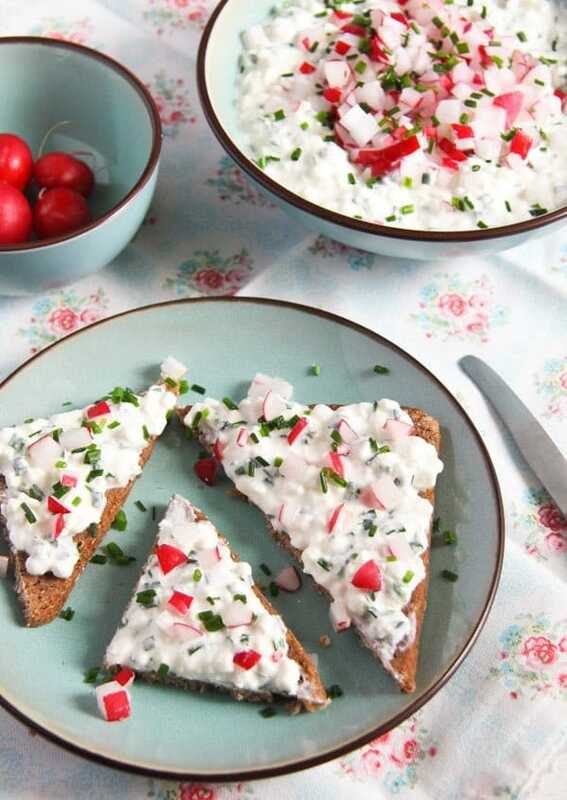 Light, fresh and delicious Polish bread spread with cottage cheese or quark, chives and radishes. Bread spreads or dips are a common affair around here, I prefer to eat a good and healthy spread on my bread in the morning or in the evening, than cold cuts or sweet spreads. Not that I mind those either, but bread spreads are so versatile and with just a few healthy ingredients you can make something new and delicious every time. I have a few spreads in my repertoire that I make only once a year, things that preserve well like the Zacusca – Romanian Eggplant and Red Pepper Spread or this Vegan Wild Garlic and Sunflower Spread, which I always make in spring and which freezes very well. And then I have all the regular spreads: cheese spreads like the Hungarian Dip or Spread with Feta, Paprika and Caraway Seeds, variations on hummus, like the Turmeric Hummus with Tahini and Garlic and many many other spreads, which I have never posted. 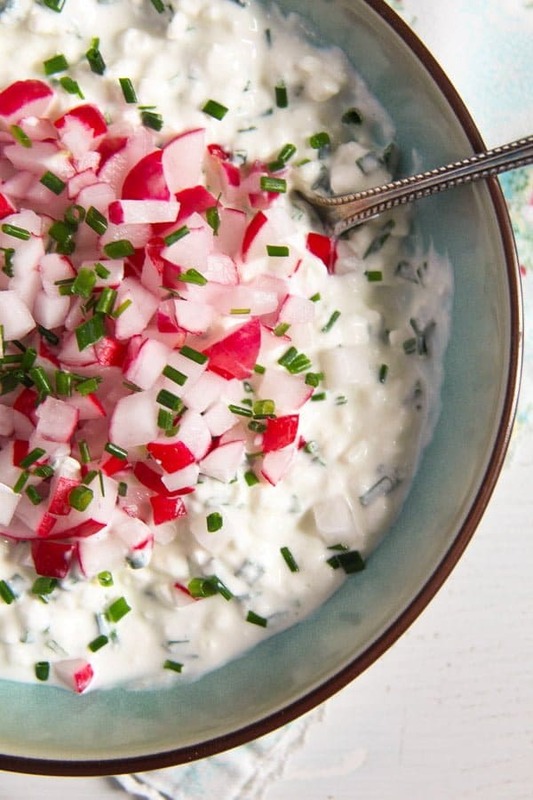 Today’s spread – the Polish Cottage Cheese Spread with Chives and Radishes is something we had every day for breakfast in the hotel in Poland last year. I tasted it the first day there and had it then every day on a slice of dark bread with some extra cucumber slices on top. Absolutely delicious! Not to mention healthy. Just some low-fat, high protein cheese, herbs and radishes, really, it can hardly get any healthier, if you ask me. 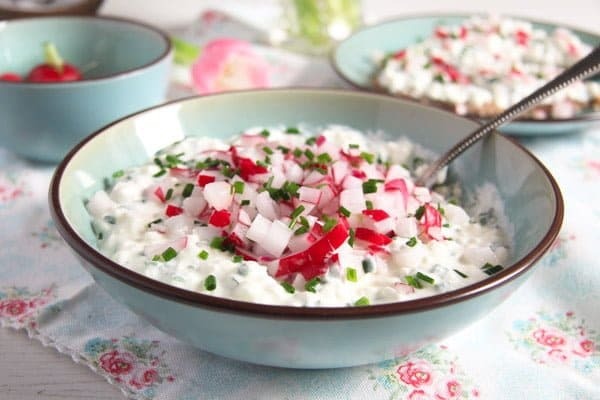 The Polish Cottage Cheese Spread with Chives and Radishes is made with twarog, which is the Polish quark, a creamy fresh cheese made of cow’s milk, which is very popular in Germany as well. The Polish version is a bit different than the German quark, dryer in consistency, but equally delicious. I have had twarog a couple of times before, I normally buy in the Russian store, however, I was not able to find it this time. 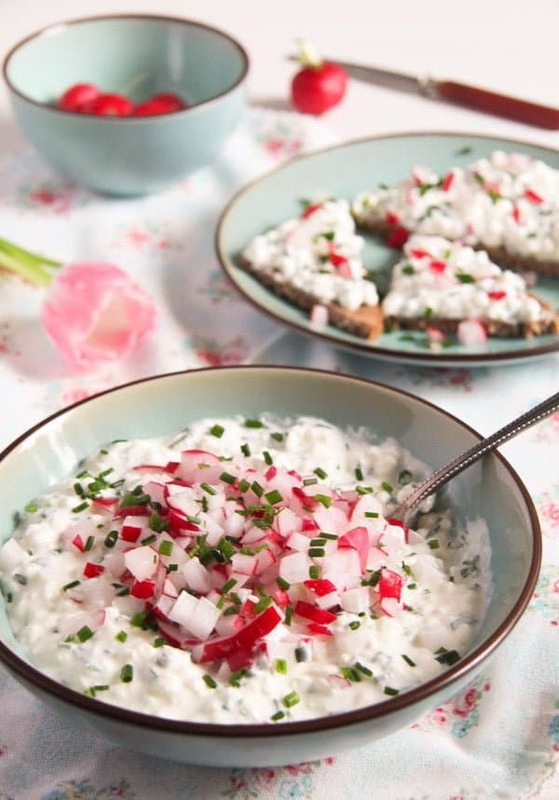 But then Sissi from With a Glass sent me a link with the recipe for her spread with chives and radishes. She mentions cottage cheese in the recipe and that is what I used this time. And it was delicious! Not as smooth as the hotel version, as cottage cheese has those big grains, which I forgot to break with a fork like Sissi recommends, but the taste is just as good and refreshing as I remember it. 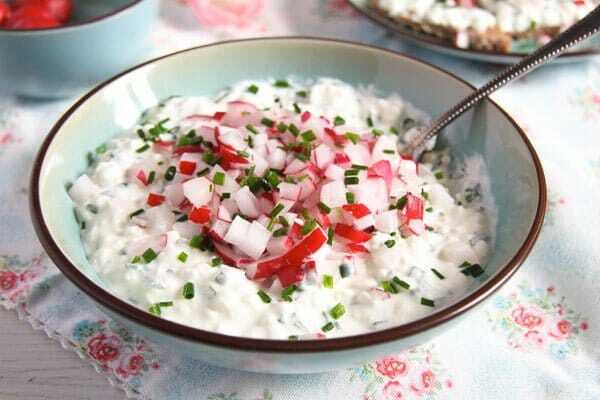 And I do not mind the cottage cheese grains at all, I enjoy eating cottage generally and I never break the lumps anyway. Sissi recommends draining the cottage cheese as well. I did that and gave the cottage cheese in a fine mesh sieve. However, after about one hour draining time, there was only about 1 tablespoon liquid in the bowl below the sieve, so I let it be. I took the cheese as it was and added less yogurt than recommended as the mixture was wet enough. I made the spread with radishes this time, which we didn’t have in Poland, but next time I will definitely add some chopped cucumbers as well. Enjoy the spread on dark rye bread, pumpernickel or my personal favorite on wholemeal crisp bread (Wasa, for instance). 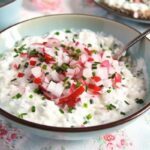 Mix together the cottage cheese and the yogurt or sour cream. 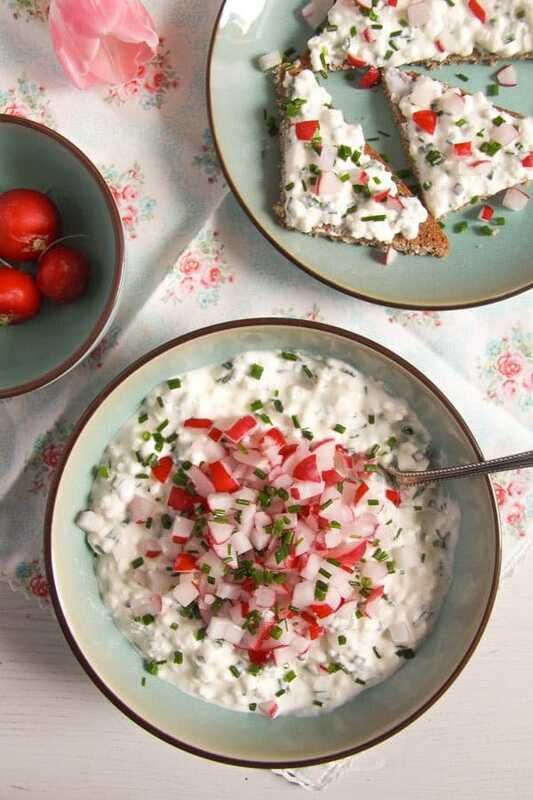 Crush the cottage cheese with a fork first, if you want the spread to have a smoother consistency. If you use quark, the quark is already very smooth, so it will not need to be crushed. Chop the chives finely and the radishes into small cubes. Give both to the cheese and mix well. Add salt to taste. Serve with dark rye bread, pumpernickel or crispbread. Can also be used as dip for raw vegetable sticks. This post contains affiliate links. The price you pay as a consumer does not change, but if you make a purchase we will receive a commission which helps support the blog. Beautiful cheese spread, Adina! It makes me think of sunny spring days… I am so happy you liked the radish version too! Thank you so much for all the kind words and links to my blog… I’m so happy you liked my suggestions. This fresh cheese seemed such an ordinary stuff in Poland, but it’s difficult to get in so many countries… Next time you buy it, try using it in the Hungarian spread too. Hungarian cheese is almost the same! (Maybe a bit drier, from what I saw on my short trip, but the taste and texture are almost the same). Nowadays apparently few Hungarians use the traditional sheep cheese and buy cow’s cheese instead. I hope I can find it again, I did buy it before but they didn’t have it this time. And thank you for the recipe, we loved it! Saw this yesterday. Just made it. Love It! I live in the California desert. Daily temperatures are usually over 42C so this is perfect. This is soooo Good. Thank you.